Danniel celebrated his 13th birthday last Tuesday, and I now have two teenagers! 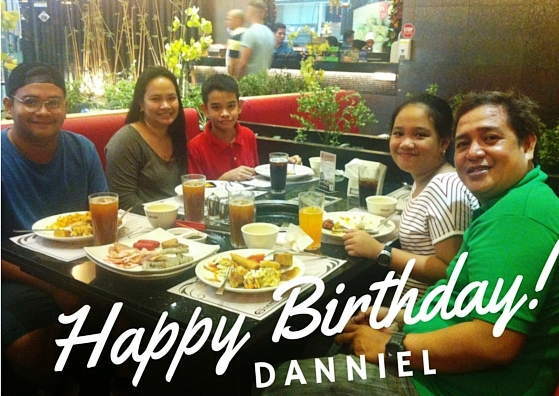 (and I am now officially ancient, hahaha) For dinner, we went as a family at Yakimix in Podium, and availed of the birthday promo. So we paid for only 4 dining guests. Unfortunately, they did not bother to sing to the celebrant, and when I asked, I should have requested for it. And when I ask if he can just get a cake, I was told to just get from the dessert station. Duh! Good thing Danniel really begged me not to make them sing otherwise I would have thrown a fit! Anyway, it was a fund dinner as it was the kids' first time at Yakimix. There was nothing spectacular about the food. but the company of loved ones and the reason for the celebration more than made up for it!